Although deer have phenomenal sense of hearing, their sense of sight isn't the best. To put it bluntly, if they were humans, they would need to wear glasses. Deer eyes are shaped larger than most mammals; however the position of the eye does not allow for much focal movement. For humans, our eyes allow us to move quickly, reading lines of text in a newspaper; or to focus on peripheral vision. We can bounce back-and-forth looking at different objects and our eyes will remain focused on that object. That's because the small area on the retina allows for light to come through our lens, similar to a movie screen. Deer eyesight is quite different. The wide band of area on the retina is what scientists refer to as the visual streak. It isn't tall from top to bottom but it is wide. What this means is that the deer is in focus horizontally; but when they look straight ahead (vertically) they are out of focus. This means they don't need to move their eyes at all. With the head stationary, deer can see at a 300 degree angle around. A slight turn of their head can reveal the other 60 degrees. How does this differ in humans? We only have focus of 120 degrees.When it comes to vision, however, a deer's vision is poor at only 20/100 vision. Although a deer may sense something is around them, they cannot focus on it unless their nose is pointed up for both their eyes to see. They even see better colors than we do and are not colorblind, as once thought. So, if deer have such poor vision why are they able to see so well at night? There are three reasons why: The first being the high density rods in their eyes. The second is that their pupil is horizontally slit which allows for light to cast on the lens easier; and the third is that they have a reflective substance on the back of their eye called the tapetum lucidum. 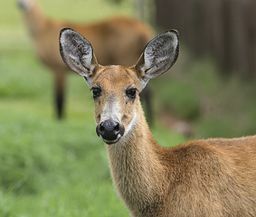 When you see a deer’s eye reflecting back at you from a flash light or a headlight, you are actually seeing the reflection of from the back of the eye. When the light enters the eye, it passes over the lens and hits the retina. The light then bounces back to the front of the eye and reflects again back to the retina. This combination allows for amazing night vision in deer. All in all, a whitetail deer can see 50 times better at night than humans! Knowing how deer see is important when installing a Deerbusters deer fence. Find the right height and width that works for your property line.